Um, can I go here ASAP?! 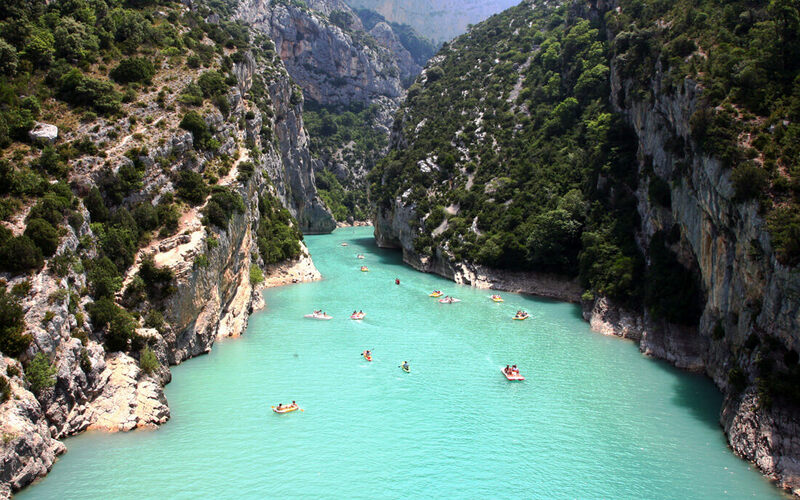 That’s Verdon Gorge, in Provence, France. (Click on the photo to get a better view!) I stumbled upon this snapshot, the other day, and was instantly transfixed. Verdon Gorge is often referred to as Europe’s Grand Canyon, though at 16 miles long and 2,300 feet deep, it’s not quite as large. (The Grand Canyon is 277 miles long and a mile deep!) Still, as far as I know, the Colorado River in our stateside canyon isn’t asВ magnificently blue as the Verdon River.В Its water gets its stunning color from microalgae and fluoride. I was struck by Verdon Gorge’s sheer beauty—and how idyllic it looks to spend a day there, drifting downstream in a raft. It reminds me of a much more dramatic variation on the annual tubing outing we embark on every year! Besides rafting, you can also go kayaking, paragliding, climbing and a number of other outdoor activities in and around the gorge. I’ve already added it to my travel wishlist.